This month Contact Editions teams up with both Photofusion and Roof Unit as part of our 'VS' series of events. We will be showcasing new work from our photographers: Chloe Dewe Matthews David Axelbank Seba Kurtis Hin Chua Chris Dorley Brown Ben Roberts Mishka Henner Ivor Prickett Tereza Zelenkova Antonia Zennaro Details of the 2 exciting events below: CONTACT vs. Photofusion: 19th May at Photofusion, 17a Electric Lane, London, SW9 8LA. Featuring opposing projections selected by Contact Editions and Photofusion. The Photofusion slideshow will present the work of ten its Members, whilst Contact will show a mix of new projects from Contact photographers and others. The event will run from 7pm-9.30pm CONTACT vs. 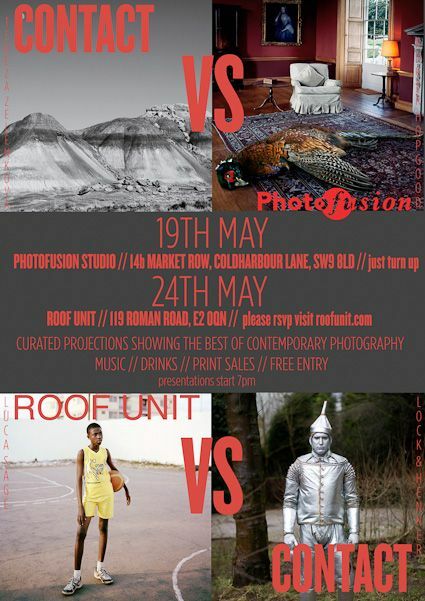 Roof Unit: 24th May at Roof Unit, 119 Roman Road, London, E2 0QN. Featuring opposing projections selected by Contact and Roof Unit. Expect an informal evening and a discounted bar with a rolling slideshows, allowing photographers and photography lovers to engage with exciting new work in an informal setting. Please RSVP to info@contacteditions.co.uk if you wish to attend either event. Contact Editions aims to support and promote contemporary photography by showcasing new work in fresh and interesting ways. As well as events, Contact is an online gallery selling affordable edition prints of emerging artists' work. We aim to show new photography from both emerging and more established artists, both in the online gallery, on our blog and through events.